On Tuesday, in the little village of Deerfield, Illinois lawmakers have had said enough is enough with their citizens’ right to bear arms. Village trustees voted unanimously in favor of a complete ban on semi-automatic rifles, pistols and shotguns with certain features. The new ordinance also bans magazines containing more than 10 rounds of ammunition. The ban against the constitutional right goes in to effect on June 13th. Citizens pose a potential $1,000 fine for every day they harbor their fugitive weapons of murder. Of course, Police and retired law enforcement are exempt from this law. I mean, Enough is Enough, but let’s not go overboard here. Who do you think we are, the United Kingdom? I ask sarcastically. Maybe I’m off my hinges. 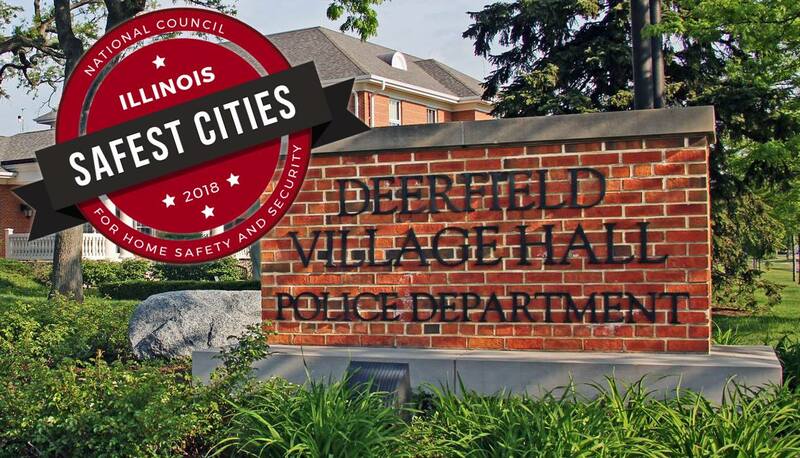 Maybe this will actually reduce the crime rate in Deerfield, Illinois. After all, Chicago is only 28 miles away or an hour drive. One could infer that the crime must be spilling over in to its adjacent neighbors. 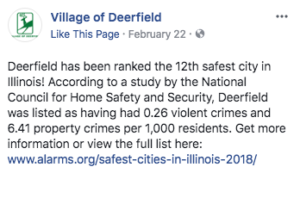 Before we can determine that, we’ll have to first identify the existing crime rate in the scary town of gun-crazed Deerfield, Illinois. The annual number of violent crimes currently sit at 5 a year. FIVE PER YEAR. And this is violent crime…which is wide range of categories from spitting on someone to brawling with good ‘ole fisticuffs to more harsh crimes. The biggest offender in Deerfield is Property crimes with a reported 124 incidents annually. So keep an eye on Crazy Old Maurice, he might not return those tools you let him borrow or some punk teenager named Skyler might break in to your car for some Menthols. Not exactly a breeding ground of psychopaths to begin with….and THIS IS WHEN THEY HAD GUNS. So despite the bravery of this legislation passed, this won’t make a huge dent in the crime-less village. So what kind of maniacs are these gun nuts? 96% of its citizens are White/Caucasian, 0.33% African American, 0.04% Native American, 2.52% Asian, 0.02% Pacific Islander, 0.43% from other races, and 0.77% from two or more races. This town is also home to the Headquarters of Walgreens, Baxter Healthcare, Caterpillar, and Consumer Digest to name a few. This place is so White and old person friendly that Senator Bernie Sanders would feel at home(Vermont is 94% White) and have insane access to the Walgreens pharmacy and Depends. Go home, Uncle Bernie! You’re drunk! Their crime rate might be low before, but now they just put a target on their town for crime and burglaries. I’d dare a major city to try and pass similar legislation. Chicago just recently had 7 people killed in 12 hours for a total of 900 murders in 15 months. 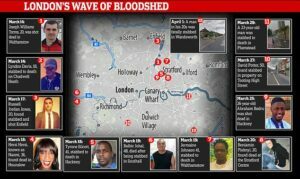 We don’t need to be reminded of the UK’s higher crime rate than the US despite their Gun Ban and now they hold a higher Murder Rate than New York City. Jolly good! Well done, chaps. Many people went to Twitter to respond to the news in Deerfield, IL. She must hate locks on her doors as they’re not inclusive enough. RUSSIA!!!!!! How did they know? It’s certainly safer than the UK as proven above and most free. No other country has the same level of freedoms we do such as Freedom of Speech, Press, Association, Religion. 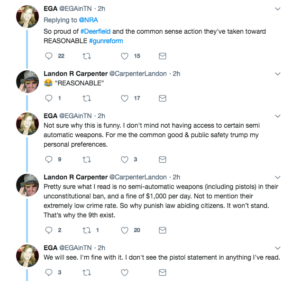 Those are protected by the 2nd Amendment, folks. Absolute power corrupts absolutely. Why would you want to give these D-Bags more power? Especially, if you think the POTUS is a “Fascist”? 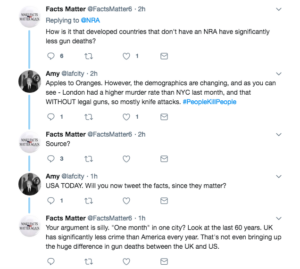 Don’t forget, kids, 2/3 of Gun Deaths are Suicides AND when someone posts stats about “Gun Homicides”, remember, there is a difference between homicide and murder. CDC has reported Guns have been used 500,000 to 3 million times defensively annually. How many of those incidents did they have to pull the trigger and kill the perpetrator? As long as “certain semi-automatic” weapons are banned that’s good. But not pistols despite more people are killed every year with pistols. “She has blood on her hands!!! !” I Scream outraged! So thanks, Deerfield, Illinois, but you don’t speak for the rest of us.